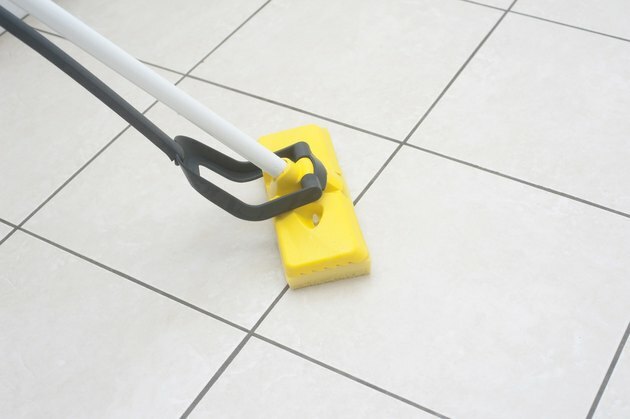 Tile grout is more difficult to keep clean than the tiles themselves, and maintaining it calls for periodic scrubbing with an effective cleaner. Grout is porous and provides a breeding ground for mold, so the cleaner should include a disinfectant. The cleaner must also be abrasive, but not abrasive enough to damage the finish on the tiles. Finally, any good cleaner includes soap, which emulsifies ground-in dirt, so you can scrub it away. You can make a cleaner that meets all these requirements with items you already have around the house and save the trouble and expense of buying a commercial cleaner. When the grout is clean, it's easy to make a tile floor shine. Most bathroom cabinets contain a first-aid kit and usually have a bottle of hydrogen peroxide as well. If peroxide can kill bacteria on a small wound, it can also kill mold growing in tile grout, but it isn't the only disinfectant that can do so. Vinegar can also kill mold, and so can bleach. Because bleach reacts dangerously with other cleaning chemicals, especially ammonia, it's a last resort when you're mixing a grout cleaner. You might also consider lemon juice, which, like vinegar, gets its disinfectant properties from its acidic nature. The value of adding an abrasive to the grout-cleaning mixture is easy to appreciate. For example, if you were to rub the grout with sandpaper, the dirt definitely comes off. However, you'd also remove the seal coat from the grout and damage the tiles in the process. You need a gentler abrasive for tiles, and two staples of most households fill the bill: baking soda and borax. Baking soda has the added benefit of being an alkalizing disinfectant, but using it with acidic ingredients like vinegar and lemon juice neutralizes that benefit. Borax, on the other hand, has a neutral pH and can be added to any grout-cleaning mixture. Whether you add Castile soap, dish soap or laundry detergent to the mixture, the result is the same. Soap and detergent emulsify the oils locked into the grout, so you can scrub them away along with the dirt locked inside of them. Although ammonia isn't a soap, it ultimately works in the same way by turning the oils into soap. You can add ammonia to your cleaner if the cleaner does not contain bleach. Mix the contents thoroughly and transfer the solution to a spray bottle. Spray it on the grout you need to clean and wait for a few minutes before scrubbing it off. Rinse with clear water, and barring spills or other unusual incidents, your cleaning is done for at least a month. This mixture is too viscous to use as a spray. You can apply it with a small paintbrush or put it in a plastic squeeze bottle and squirt from there. Allow the mixture to sit for a few minutes before scrubbing with a kitchen scrubber or -- even better -- an old toothbrush. Grout cleaners come in many forms. You can adjust the ingredient proportions in either of these recipes if the cleaner doesn't get the job done. You can also substitute other ingredients or even adjust the consistency of the mixture according to need. For example, adding more baking soda or borax makes a thicker paste that enhances scrubbing power, and combining vinegar with peroxide makes a stronger disinfectant.